Get a sense of the local culture at Amber Fort and Nahargarh Fort. Next up on the itinerary: get engrossed in the history at City Palace of Jaipur, admire the landmark architecture of Sheesh Mahal (Hall of Mirrors), look and learn at Jantar Mantar - Jaipur, and steep yourself in history at Jaigarh Fort. Inspirock's itinerary builder makes planning a Jaipur trip simple and quick. Hyderabad to Jaipur is an approximately 2.5-hour flight. You can also drive; or take a train. Traveling from Hyderabad in January, things will get slightly colder in Jaipur: highs are around 26°C and lows about 9°C. Finish your sightseeing early on the 14th (Sun) to allow enough time to travel to Udaipur. Your cultural itinerary includes sights like City Palace of Udaipur and Monsoon Palace. There's much more to do: contemplate the waterfront views at Lake Pichola, look for gifts at Ashoka Arts, take in the spiritual surroundings of Eklingji Temple, and admire the landmark architecture of Jagmandir Isla. To find where to stay, maps, other places to visit, and tourist information, use the Udaipur trip itinerary planner . You can fly from Jaipur to Udaipur in 1.5 hours. Alternatively, you can drive; or take a bus. Wrap up your sightseeing on the 16th (Tue) early enough to drive to Ranakpur. The village of Ranakpur sits in a densely forested nest of hills, its white marble architecture framed by lush greenery. Kick off your visit on the 17th (Wed): contemplate in the serene atmosphere at Surya Narayan Temple, take in the spiritual surroundings of Chaumukha Temple, and then contemplate in the serene atmosphere at Jain Temple - Ranakpur. For more things to do, maps, where to stay, and other tourist information, you can read our Ranakpur trip tool . Drive from Udaipur to Ranakpur in 1.5 hours. Finish your sightseeing early on the 17th (Wed) so you can drive to Jodhpur. The blue-walled buildings in the old quarter of Jodhpur have a calming, quaint aesthetic when viewed from up high, but down on the streets the city bustles with a lively atmosphere that belies its toy-town color. Get a sense of the local culture at Mehrangarh Fort and Umaid Bhawan Palace Museum. The adventure continues: contemplate the long history of Jaswant Thada, look for gifts at Spice Paradise, stroll through Rao Jodha Desert Rock Park, and admire the natural beauty at Mandore Gardens. 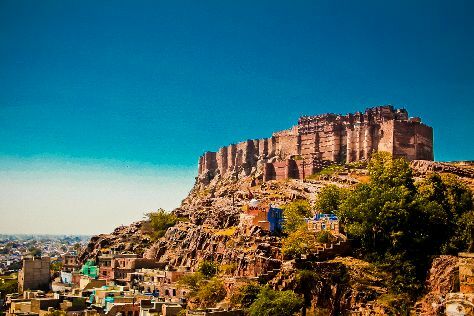 For where to stay, maps, traveler tips, and more tourist information, go to the Jodhpur holiday planner . You can drive from Ranakpur to Jodhpur in 2.5 hours. Alternatively, you can take a bus; or take a train. Cap off your sightseeing on the 20th (Sat) early enough to travel back home.